Wife to The Undad. Mother to "Valdy" and "'Beth"
My husband is adopted. How he connects, attaches and loves is very different from me. My husband is particularly good at self-sabotage. His unintended, but often realized, survival philosophy has been “if I push you away it will hurt less than if you push me away.” Except, it doesn’t work that way and the hurting, steeped in regret, never stops. My husband and I spend a lot of time clawing and fighting our way over the damaged foundation our love is built on. Between the stress and demands of my chronic experience with pain and illness and the emotional trauma Trent battles we rarely make things easy on ourselves or each other. Through it all, we try to honour our love for each other with gratitude and forgiveness. We are teaching our children about love and perseverance. We are teaching our children that even at our worst we are still at our best together. When Beth first arrived I loved her. I loved her, but I also resented her. I held her. I cuddled her. I sang to her. I nursed her. I played with her. I stroked her. I came to her when she called. I walked the floor with her night after night, and yet I couldn’t shake the sinking feeling of despair, loss, exhaustion, frustration, and anger. I was consumed with guilt. What if she knew? What if she, also, spent a lifetime battling attachment like her father? What if she never trusted in an “I love you no matter what” love? Trent and I often grapple with his experience of love. Born Sean Robert Chant on October 15, 1975 in Sydney, Nova Scotia, he was put up for adoption and the records were sealed. Was he loved, desperately? Was he wanted? Was he cuddled close by someone who spent months lovingly picking out the perfect name for a boy and a girl? Did the woman whose voice had soothed him on the inside, comfort him in the hours and days after his arrival? Did she nuzzle her nose to his and whisper Sean over and over again? Did he love her and then she left him in the arms of someone else? Did he connect his name and the sound of someone’s voice with a safe place and then one day soon find everyone echoing entirely different syllables energizing his safety with an element of unease? Did he arrive in a rush when everyone was too busy to hold him? Did he cry in a nursery with too many babies and not enough staff? Did he scream for the voice he had heard for months prior only to hear nothing? Was he forced to self soothe, immediately? Was he fed only when the clock on the wall suggested it was appropriate? Did he attach? Did anyone attach back? I am very fortunate because our children are the best at everything. They can do and be anything. My husband once wrote a story about it being a form of child abuse to tell a child that they can be anything they want because statistics tell us this is untrue. Fortunately, our children are so awesome this isn’t a concern. Of course, my children would be this awesome. After all, they are my children and my parents have spent 36+ years telling me I can do and be anything, lifting me up, raising my spirits, encouraging me, teaching me, supporting me, and filling my heart and life with boundless love. This is what the love of a parent is. We make choices. We chose to apply the lessons of love we are taught. We also choose to keep or toss our previous lessons of abuse, emotional, verbal and physical. Upon meeting a partner’s mother years ago she asked me to take a walk with her. Over the course of two hours she shared every misstep, every perceived failure, every moment of anguish from her son’s life that she could recollect. She was surprised that I was aware of them all. She expressed disappointment in her son’s choices. He was the only one of several siblings that had not saved to make a down payment on a home. He had been offered the chance to have a downpayment matched by his parents and hadn’t taken advantage of this offer. She saw this as wasting an opportunity. A lack of focus. A lack of drive. I remember saying her son had no previous need to own his own home. That renting can be a more practical choice when income sources are not reliable or consistent. I remember sharing with her how many different education paths I had begun to venture down in the past, only to decide I wasn’t suited for them. I remember commenting that I’d rather a relationship end before marriage than after. I remember her asking if a professional woman like myself was embarrassed to be with him, and my response that I couldn’t imagine being with a better human being. How much kinder would the world be if there were more people like him? I wonder what has to happen to a parent to make it ok to a treat a child, of any age, like that? How much hurt did they have to have experienced? Or did they experience hurt? What if they spent so much time dreaming of what their life with children would look like, that they didn’t prepare for the potential that life is messy, and children are not perfect? What if the child was expected to fit into tab a but was designed to slide into slot c? What then? On more than one occasion my mom and I have visited psychics together. I am a sceptic but TWICE have been told the story of the same past life. Shaking my scepticism is the story of how I once was an aborted fetus that returned to heaven abused, and without trust, asking to never return to Earth. The story of how I was assigned to keep my mother safe and then later asked if I could return to Earth as her baby. I watch how our children smile when Trent walks into the room. The pride our son displays when he shows me the latest dance routine he has developed with his dad. 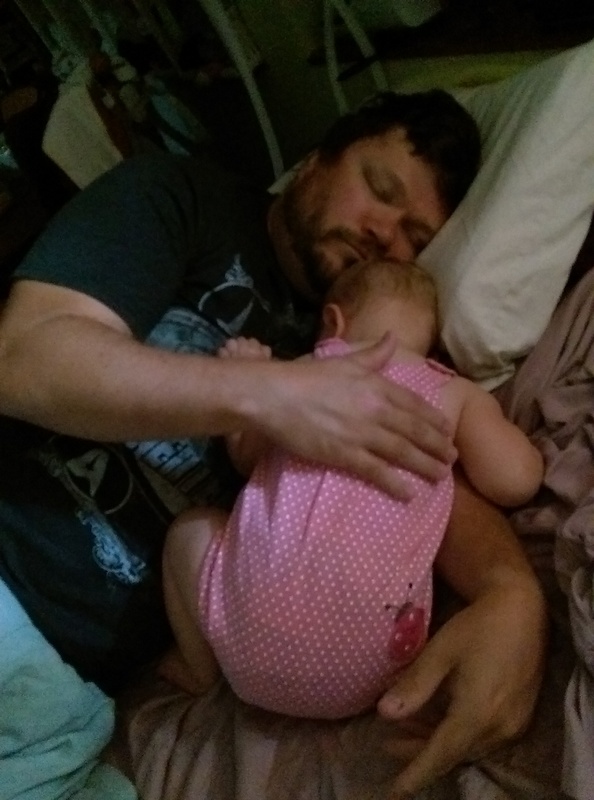 How calm our daughter gets when in her daddy’s arms and how well she sleeps cradled in them. I am comforted knowing that no matter what I am loved. I am glad that we are teaching our children that no matter what they are loved. I am proud that my husband is learning to celebrate his strengths, is increasingly self aware of the potential of his creative pursuits, is fighting at my side to help provide for our family, and will drop everything to kiss an owie, change a diaper, snuggle a baby, comfort a toddler, and spends time each day building up, encouraging, reinforcing and giving our children the kind of love that builds strong, successful, independent and kind people!